Oklahoma City Chapter was founded in 1947, four years after the founding of the national organization. It was through the efforts of Mr. and Mrs. LD Lacey and the American War Dads and Auxiliary that the Oklahoma City Chapter was organized. The membership was very active in volunteering and spent many hours working at the Veterans Administration Hospital, Christmas Seal Campaign, Girls and Boys Scouts, Camp Fire Girls and war relief clothing drives. Several of the ladies became active in the national and regional organizations. In the mid-1980s a concerted effort was made to reach unknown members, at the end of that membership drive the chapter had 118 members. That is the highest number of members. In 1992 there were 95 members.Today we have 47 members. 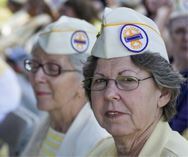 We have World War II, Korea and Vietnam widows in our organization. Our membership is getting older and less active. We are making plans for an event to honor and introduce Gold Star Wives, Inc. to widows of the recent conflicts. We have our regular meeting, a luncheon, on the third Wednesday at 11 o'clock at Junior's in the Oil Center on NW Express Way. We have only 6 to 12 members that attend. In June 2013, we had six of our members attend the national convention in Denver. The building offers free street level parking. Junior's is located on the ground floor. We enter on street level and take elevator service to the ground floor. We have a private room and order our individual lunch from the menu. Lunch is served in our private room. The food is good. They bill us individually. We order lunch at 11:00am. Our program/meeting will start at 11:45am.